Look deep into his eyes. No, don't. To some, it is the smirking face of greed — the personification of the unbridled drive for cash that crashed the ecomony. To others it is just the face of evil: A visage, at least for the wealthy art collectors at the Armory Show this week, that is just to painful to face. So, it should come as no surprise that Chinese artist Yan Pei-Ming thought a Bernie Madoff perp-walk image would make a provocative subject for a painting. 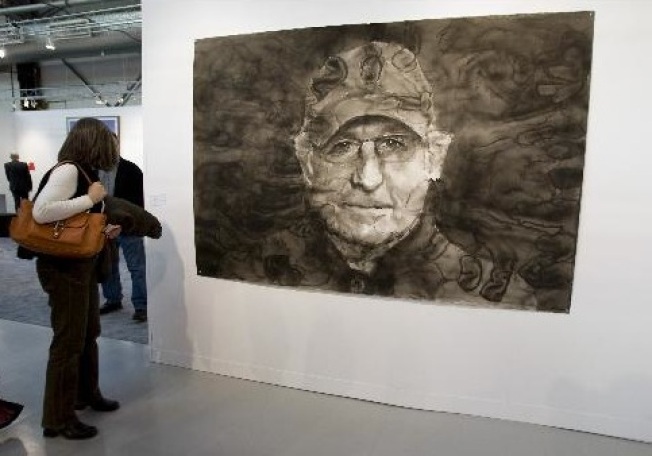 The 7-foot long gray-scale watercolor is nearly filled with Madoff's face. The artist based the painting on news photographs of Madoff, so he had better cross his fingers that some overzealous photo service doesn't do to him what the AP did to Shepard Fairey over his Obama image. Pei-Ming might not have anything to worry about, because nobody seemed the least bit interested in purchasing the $10,000 painting at David Zwirner's stand at the Armory show. There was not a single inquiry, according to Bloomberg News. Then again, maybe it's just that none of them have the money.